In a For The Record Q & A, lead author Gary David, PhD, analyzes a first-of-its-kind academic study detailing how medical transcriptionists do their jobs. “The medical transcriptionist [MT] is the most frequently forgotten part of the healthcare documentation production chain,” according to the preliminary findings of the 2007 Survey of Medical Transcriptionists. As part of a larger project examining the role of the MT, Bentley College researchers are, among other things, searching to redefine how MTs are factored into the delivery of healthcare. With phase 2 of the research set to be completed in late spring of 2009, lead author Gary David, PhD, an associate professor of sociology at Bentley College, and colleagues are currently presenting the survey findings at a string of national conferences. In fact, look for more in-depth analysis at the annual Association for Healthcare Documentation Integrity (AHDI) conference early next month. In the meantime, For The Record spoke with David to ascertain his thoughts on this “first of its kind” survey and what it means for MTs. For The Record (FTR): What prompted you to do this survey? Gary David, PhD (GD): The survey is part of a larger study of the work of medical transcriptionists and the medical transcription industry in general. We started the project to examine how MTs do their work. When we found out there really wasn’t any demographic data out there on the MT profession, we decided to do a survey. It was created with the assistance of various highly experienced MTs and with assistance from the AHDI. FTR: Why do you say this is the first study of its kind, and why do you think this is so? GD: It is the first academic study of the MT profession that we know of. We have been doing this project for over a year and have asked industry representatives, MTs, other affiliated personnel, as well as academics involved in the study of medicine, and no one has heard of any academic study of MTs. MTs have been examined in the context of some larger conversations, such as whether they are replaceable, too expensive, etc. However, nothing that we have found documents the work itself, and this is one of the primary foci of the study. FTR: What surprised you most about the results? GD: In terms of our analysis, we have only started to examine the descriptive statistics, not having a chance to go deeper into correlations between questions, as well as the range of open-ended responses we have. So, all of our findings are very preliminary. I wouldn’t say that anything was surprising, but it really confirmed many of the things that we heard, including the potential age gap in the workforce, the pay ranges, and the number of people who have gone through training programs. Perhaps one of the most remarkable findings thus far is how many MTs transcribe for multiple dictators at multiple hospitals. That has some potential serious repercussions in terms of its impact on work. FTR: How can this information be used as a tool to improve the industry? GD: The first thing is awareness. Again, I don’t know how much information is new at this point, but it does confirm what a lot of people have been saying. Having a third-party, independent group doing this research is helpful to validate what people have been saying and also provides alternative perspectives that have perhaps gone unnoticed. In terms of using the information, that is the big question. The industry has been behind in terms of defining itself. The data provide some important insight into the state of the MT workforce. We expect to have more powerful findings once we start looking at correlations and relationships, as well as the open-ended questions. FTR: The findings mention that “the medical transcriptionist is the most frequently forgotten part of the healthcare documentation production chain.” Why do you think this is, and what can be done to remedy it? GD: There are a variety of possible factors. One is that they are very good at what they do and, thus, render themselves invisible. Second, we can think of MTs as being “out of sight is out of mind.” The movement of MTs from the healthcare setting to their homes has a major impact in terms of how they are viewed as part of the healthcare documentation team. Third, MTs are not viewed as revenue generating and, therefore, not essential to the process. This is coupled with the view that “all they do is type,” which is not the case. Transforming dictated voice files into complete healthcare documentation is an amazing skill that involves a range of competencies. Ultimately, doctors do not generate revenue; documents generate revenue. When reimbursement occurs, it is based on the documents. When audits occur, they are based on the documents. Coding is done on the documents. Without quality documents, this process can break down. The more people are aware of this, the more appreciation there is for the work. We know the AHDI tries a range of activities to increase awareness of MTs. We have a number of ideas about how to further create awareness among dictators, healthcare executives, and other industries, and implementing these ideas will be part of phase 2 and 3 of our research. FTR: Please detail the research that is being done at Bentley College regarding MTs and what you hope to learn. GD: There are four general categories that are part of our research. • Ethnographic Study of Medical Transcription: Through ethnographic and field-based research methodologies, it seeks to understand the details of how healthcare documentation production is achieved, especially the role of medical transcriptionists in the creation of medical records. Other aspects of the project include identifying the critical success factors associated with productivity and quality, examining the risks and benefits of strategic outsourcing and offshoring, developing metrics for quantifying success, and creating awareness of best practices in technological design, implementation, and use. • Balanced Scorecard for Medical Transcription Service Organizations (MTSOs): The Balanced Scorecard is a methodology that assists an organization in developing metrics based on their strategy in order to drive long-term performance. It is a strategic management system that enables managers to see the breadth and totality of company operations. It yields a balanced set of metrics by combining financial, customer, internal process, and innovation and organizational learning perspectives. • Quality Assurance & Assessment Measurement in Transcription: Members of the research team, along with Richard Cleary, PhD, from the department of mathematics, have been working with the Medical Transcription Industry Association [MTIA] and the AHDI on developing an “acceptable” practices approach for qualitative assurance and assessment. This includes how to score errors, how judgments are used in conjunction with industry standards, and what impact scoring practice has on the creation of assurance and assessment. Our primary role is not advocacy—it’s research. That said, an important part of our research is how it can be applied in a meaningful way to support and enhance the healthcare documentation production process. Through conversations with the AHDI, MTIA, MTSOs, and MTs, we are hoping to find ways that the results of the survey can be useful in a meaningful way to the industry and those who are working in it. We are hoping to be able to expand our conversation to the AHIMA, HIMSS, and other related groups. 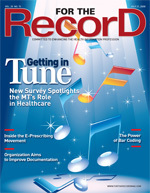 FTR: “Doctors do not generate revenue; documents do,” according to the findings. Please explain this statement and why the public’s perception is often skewed. GD: In terms of the perception being skewed, it is probably in large part due to the work being devalued and the role of transcription in the revenue generation cycle. In many ways, it is a lynchpin in this process. However, it is seen as a cost and not a part of revenue generation. As we learn more about the work of MTs, we find how it serves as an important part of the QA [quality assurance] process in healthcare documentation. If one assumes that everything a dictator says is correct, then MTs do not serve that important of a role. If, however, you assume that dictators make mistakes, do not provide complete information, and do not fully capture the elements of the encounter, then having people in place to catch that becomes very important. Finally, we have been told that dictators frequently sign off on documents without closely examining them (or reading them at all). This makes the job of MTs even more important. FTR: What did you find out about speech recognition technology (SRT)? GD: SRT is not one thing or another; it is a technology. In and of itself, it does nothing. As with any technology, it is the manner in which it is developed and integrated into the workplace that matters. Thus, it is impossible to cast any broad judgment about it given how varied medical specializations are. Front-end SRT might be perfectly suited to radiology or pathology, but that does not mean it is as suited to pediatrics or an ED [emergency department]. We have spoken to MTs who love editing vs. transcribing and those who do not. This is something we need to examine more closely to understand. The fascination with SRT is similar to what we might find in other industries when a technology starts to capture the attention of everyone. We can refer to this as a type of ‘techno-fetishism,’ where the fascination with the technology drives the decision-making process. We need to understand more of the impact that it has on the workplace by studying its use in the workplace. Furthermore, we have been told by MTs that one’s mind works differently when editing vs. transcribing. One part of this is when editing, you are determining whether what was said matches what was generated as a measure of “accuracy.” When transcribing, MTs are determining accuracy in terms of whether what the doctor said makes sense. If this is lost when editing, that is a major concern. FTR: Because the MT workforce is aging and younger recruitment is such a problem, is telecommuting where the MT’s future lies? GD: Telecommuting is going to be important to many workforces in the near future. However, one challenge of this is maintaining connections among workers. According to our survey, more than 70% of those who responded work from home. This means that telecommuting is not only the future of MTs; it is also their present. One has to keep in mind that wanting to work from home does not mean wanting to work in isolation. All one has to do is go to any coffee shop and see the number of people with laptops working. This is often because people want to be around people and not just in their homes. Of course, MTs cannot work at a coffee shop on a wireless connection. Therefore, the development of virtual workplace communities among MTs becomes a paramount issue. This is another problem we are working on using theoretical foundations and trying to apply them in practical ways. FTR: The survey findings say there is a higher representation of male MTs globally. What do you think is behind this higher representation outside the United States? GD: We do not have any numbers on this, with our information being anecdotal. All one has to do is walk into an MTSO in India (which we have) to see this. Talking with people in the Philippines and Barbados has also revealed a similar story. It is an interesting question in terms of why and something we are trying to learn more about in phase 2 of our study. One reason could be the gendered nature of work here in the United States, where MTs were formally known as “medical secretaries.” People have strong schemas in terms of what gender matches what job. You say professor and people think of men; you say teacher and people think of women. The same is true of saying doctor vs. nurse. MTs are seen as a female job, which it largely is, which of course creates a cycle of gendered work. FTR: What are the current education requirements for MT jobs, and what can be done to give MTs more training? Could this be another possible area for recruitment? GD: We haven’t looked closely at the education requirements but have heard there are a range of training programs available. Some are accredited through the AHDI and have an extensive two-year curriculum. Others are referred to as matchbook programs because they are advertised on the back of matchbooks. These, we are told, are far less intensive and promise high-pay work after six weeks of training. We would like to look more intensively at the training programs and what elements are part of them. We know that the AHDI is partnering with the Department of Defense for military spouses as part of a larger recruitment initiative. A larger problem with recruitment is that the work is hard without an immediate promise of financial return. The medical transcription industry violates the laws of supply and demand: Given that MTs are in short supply, they should garner higher pay. However, this is not the case. This is partly due to the belief that their work does not add value. The more that can be done to change this view and provide some career paths within the industry, the better chance there will be to recruit and retain an MT workforce. For more information on the study, visit www.bentley.edu/mt-study. — Juliann Schaeffer is an editorial assistant at For The Record. Scott Faulkner, CEO of InterFix Ventures, believes the findings of the 2007 Survey of Medical Transcriptionists are right on the money. “First, the correct conclusion that ‘doctors do not generate revenue, documents do’ is simply perfect and highlights the crucial role quality records play,” he says. Peter Preziosi, PhD, CAE, CEO of the Association for Healthcare Documentation Integrity (AHDI) and the Medical Transcription Industry Association (MTIA), singles out the finding that more education is necessary, which poses a challenge for the largely home-based workforce. “The large percentage of home-based workers points to challenges in providing continuing education and management resources to an isolated and somewhat fragmented workforce,” he says. Faulkner and Preziosi also agree with the survey’s perception of speech recognition technology, which illustrates a fascination with the technology itself as a “one-time solution” with less thought on workflow processes and the human aspect. “Organizations frequently adopt technologies without taking into consideration the end user or the impact the technology may have on workflow processes. Anecdotal stories from around the country report healthcare enterprises adopting speech recognition technologies with the hopes of eliminating transcriptionists only to have to rehire them when the software falls short,” says Preziosi, who points out that technology adoption is not a quick fix and requires an interface with human intelligence.